Belgard Project Visualizer - Don't Wait, Start Designing! 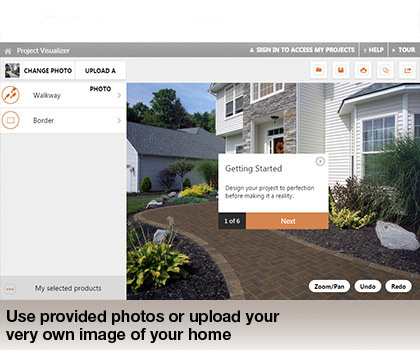 The Belgard Project Visualizer lets you upload photos of your space, then insert and experiment with various paver styles, shapes and colors. Need a second opinion? You can share your custom designs with friends and family in just a few clicks. The program also saves your choices so when you are ready to start, simply send them to your Belgard Authorized Contractor or Belgard Authorized Dealer and take your project from imagination to creation. Don't wait - UPLOAD YOUR PHOTOS NOW - IT'S JUST THAT EASY.